Abstract: As project lead, development architect or tech-savvy person you are looking for comprehensive examples that showcase how to realize own business solutions on SAP Cloud Platform. 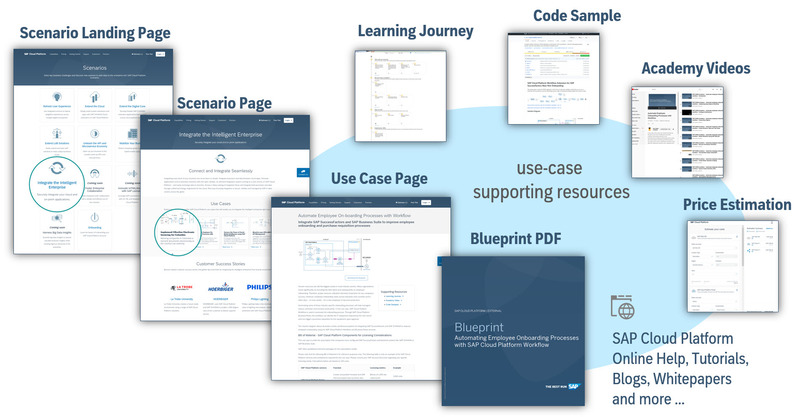 This blog introduces the new scenario use case pages on the cloudplatform.sap.com website that are backed with comprehensive hands-on enablement resources including blueprints, pricing estimates, learning journeys, academy videos, code samples and tutorials. Being asked for the best approach towards using SAP Cloud Platform for your business my answer is “scenario-based learning”. Concrete use cases for different application scenarios give you and your team exposure to how other experts solve real-world business cases and the opportunity to hone those skills yourselves. That’s exactly the intention of our new scenario pages, use case pages and their linked enablement resources we provide on the cloudplatform.sap.com website starting with SAPPHIRE ’18. Also look at our leading SAPPHIRE ’18 blog on How SAP Cloud Platform Powers the Intelligent Enterprise. The scenario landing page provides a central access to different scenarios like Extend LoB Solutions or Integrate the Intelligent Enterprise. A scenario is a high-level instance in which a customer is trying to add business value or solve a particular business challenge. A blueprint provides the mapping of technologies to achieve the outcome with a feasible architecture using SAP Cloud Platform (depicted with solution diagrams). A blueprint document, e.g. Automating Employee Onboarding Processes with SAP Cloud Platform Workflow, is the central part of the use case documentation. The blueprint and the “Supporting Resources” section on the scenario use case page provide access to a variety of valuable assets for further guidance and more specific technical knowledge, e.g. videos, tutorials, code samples, price estimates, learning journeys or documentation for user assistance. Extend the Digital Core: Develop flexible SAP S/4HANA extension applications that function across cloud platform services. Harness Big Data Insights: Quantify big data insights to expose valuable business insights while meeting rigorous demands of the enterprise. Foster Enterprise Collaboration: Enable enterprise-wide collaboration with a simple and efficient out-of-box solution. Innovate IoT/ML/Analytics with SAP Leonardo: Leverage SAP Leonardo to innovate with IoT, ML and Analytics on SAP Cloud Platform. Related hands-on and tangible SAP Cloud Platform use cases that enable your own realization of the scenario. Use Cases are listed as tiles with solution diagram, title and short descriptions. 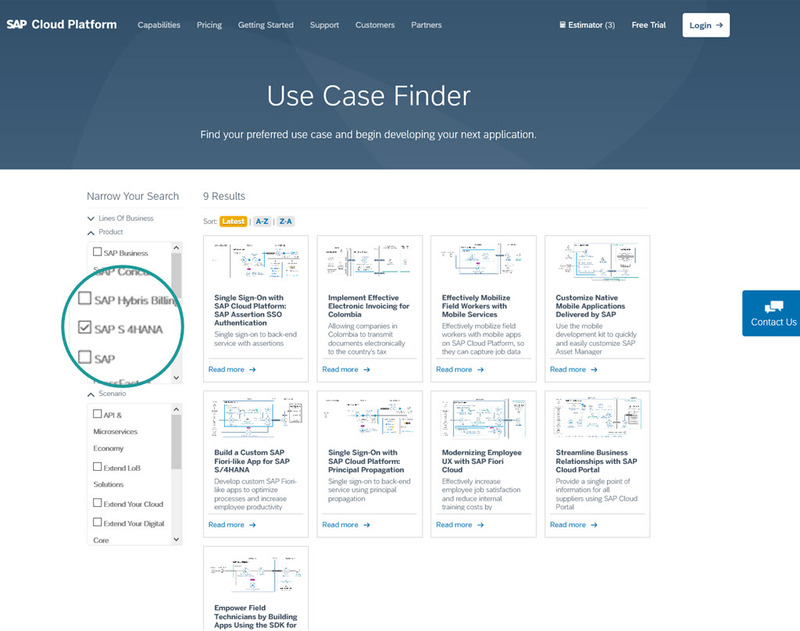 Every use case is described with its own web page that provides a high-level introduction, a solution diagram for the end-2-end architecture, a link to the in-depth SAP Cloud Platform Blueprint document, a “supporting resources” box with links to related enablement assets (videos, code samples, tutorials, learning journeys) and a “Bill of Materials” section with the used SAP Cloud Platform components for licensing considerations. We also integrate the use cases with the pricing estimator that gets filled with all components and services from the SAP Cloud Platform product catalog that are needed for the solution architecture. We meanwhile provide the following set 32 SAP Cloud Platform use cases that are associated with at least one of the above 11 scenarios (in alphabetical order). Blueprints were first introduced in September 2017 and have been further improved with dedicated sections that reflect the main phases and target roles needed to ideate, plan, implement and operate the described solution. Every blueprint section for these phases ends with a “More information” box that lists recommend resources from other channels like blogs, technical documents or SAP Cloud Platform Online Help. All together the Blueprints and the attached enablement assets are effective approaches to successfully realize your own projects on SAP Cloud Platform. You can help improving the SAP Cloud Platform Blueprints with own feedback. Go to the SAP Cloud Platform Enablement Assets influence session http://influence.sap.com/sapcp-enablement-assets and click Submit Improvement to send your feedback or report an error. The SAP Cloud Platform Product Management team watches this channel to include valuable feedback into the blueprint planning and update process. Note: to enter feedback in SAP Customer Influence you need to login with your sap.com community user. For more details on user account creation see https://www.sap.com/community/getting-started.html. Super excited to see this live in all its beauty now! Great job by the whole team! Kudos! Great to see plenty of key scenarios covered. Is it possible to make the “Use case finder” option more visible on the site? I found it as a link at the bottom. Thanks Bertram for launching this content on Cloudplatform.sap.com. Invaluable content for anyone interested in exploring SAP Cloud Platform and building innovative applications. Members of SAP PartnerEdge Open Ecosystem – Build will certainly appreciate it! UPDATE: I just completed the scenario and use case tables with new entries for assets we published in October 2018 for SAP TechEd ’18.